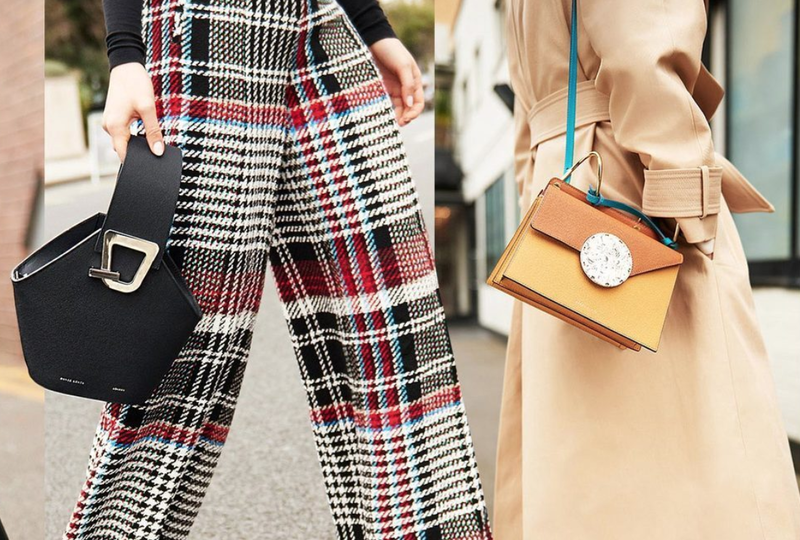 Danse Lente designs are definitely the 2018 most instagrammable bags. 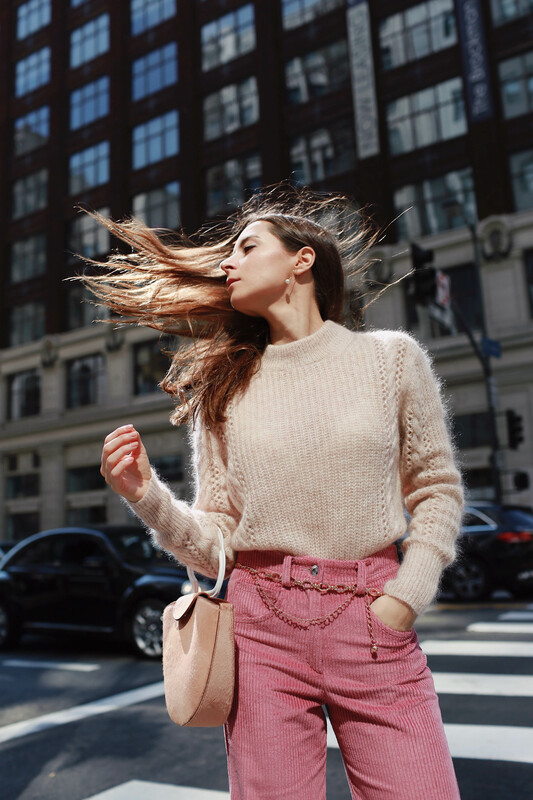 I saw this irresistible emerging label everywhere on numerous fashion editors and bloggers on Instagram. Since then, I have been obsessed with these neo-luxury handbags. Danse Lente, which means Slow Dance in French, focuses on high-quality leather goods inspired by contemporary aesthetics and modern architecture. This emerging label designs unique and sculptural bags. Each bags are very different from each other (bucket bag, jewel bag, leather tote, shoulder bag, cross body, etc). Fashion editors and bloggers are obsessed with this minimal label. 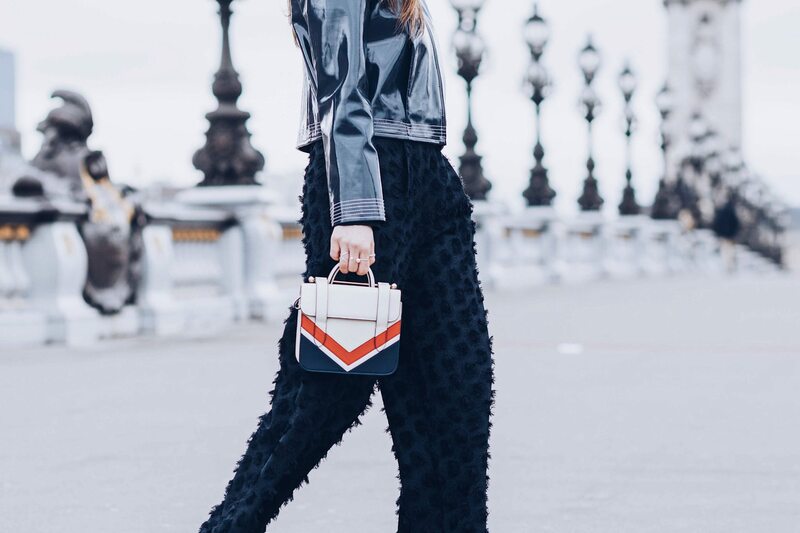 These luxury handbags currently cost less than $500. No wonder why this label has been sold out so many times. You can buy your Danse Lente bags at high-end and fashion-forward online stores such as Luisa Via Roma, Moda Operandi, Monnier Freres, Net a porter, My Theresa, Nordstrom space, etc. I contacted Danse Lente and they gifted me two of my favorite styles (lucky me right! ): the shearling bucket bag and the calf hair leather tote. The quality is very good. In addition, I was also impressed by the attention to detail inside and outside the bags. I absolutely love how they complement my outfits. Danse Lente is definitely a brand to consider for your next It-bag purchase. Wearing the Lilou Bag, Zara pants, and Sezane Polka dots shirt. The Lilou calf hair and textured leather tote in neutral. This sleek “Lilou” bag is exclusively available at Net A Porter. Danse Lente made this bag in Italy from smooth blush calf hair. The graphic top handle mirrors the shape of gymnastic rings. Furthermore, you can also wear this bag as a shoulder bag with its glossy gold chain strap. 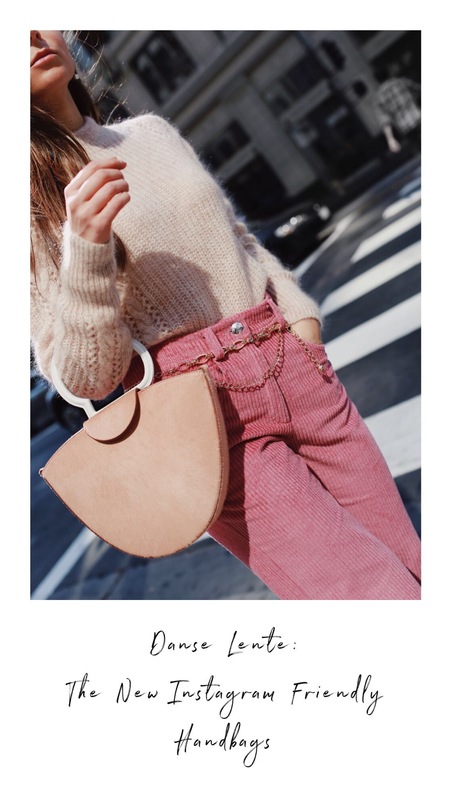 Outfit details: Lilou bag by Danse Lente, Musier Paris Emmanuelle pink corduroy pants, Musier Paris belt Katia, Tara Jarmon Sweater, earrings: And Other Stories, Whowhatwear collection patented boots (similar here). The Bobbi bucket bag is one of the most sought-after styles for this fall-winter season. I love the materials used for this bag: genuine shearling and color-block emerald green leather. Also, this structured bag features a polished gold-tone D-ring accent pierced along the side for an edgy finish. In addition, you can also attach the crossbody strap to wear it on the go. Outfit details: Bobby bucket bag by Danse Lente, Ash Paris white boots (similar here), Whowhatwearcollection dress and cardigan, Belt Isabel Marant. Want to know more about Danse Lente? Read this interesting interview of Youngwon Kim, founder of Danse Lente on Elle.com. Outfit details in this blog post. Pictures by Stefanie M Mariee. Creative director, stylist, and model: Julia Comil. More emerging designer IT-bags? Check out this article. Disclaimer: I contacted Danse Lente to feature this brand on my 2018 most instagrammable bags story. I received the items to try for free. I truly believe this label is worth knowing and learning about, hence the blog post! As always, opinions are my own. This blog post contains affiliate links. Oh these bags are so cute! I would take one of each, they’re all so perfect for Instagram! I love the Lilou bag! Thanks!! I have a big crush on the Lilou too!! Such a great post! All of these bags are so unique and I am loving the different designs! Definitely need to put these on my wishlist! I see why they are so instagrammable! Their design is super unique and chic. I am loving both of these bags! Great review! These bags are gorgeous! The designs really are Instagrammable! I seriously need ALL of these bags in my life!!! They are seriously so photogenic! Totally!! And so practical!! Thanks!! Thanks!! I love this brand so much! !